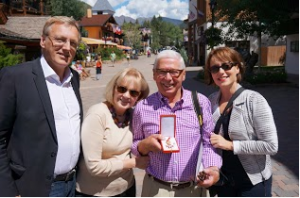 Former Vail mayor and current Vail Town Council member Ludwig Kurz recently was awarded the Austrian Decoration of Merit in Gold for his “outstanding efforts and achievements with regard to the close friendship and partnership” between Beaver Creek and Lech-Zürs in Austria. The sister resort relationship was first forged 12 years ago when a group of Vail and Beaver Creek officials visited the Austrian resort towns of Lech and Zürs on a side trip while attending the World Alpine Ski Championships at nearby St. Anton. From left, Austrian Trade Commissioner Rudolf Thaler, Susan and Ludwig Kurz and Consul General Karin Proidl in Vail. Kurz organized the trip to show the American contingent two of the most high-end Austrian ski towns. Although he’s called the Vail Valley home since 1966, Kurz is originally from Salzburg, Austria. That side trip in 2001 led to a sister-resort relationship that includes student, ski instructor, musician and chef exchanges, cultural trips back and forth for end-of-the-season parties and Oktoberfest celebrations and residents traveling back and forth for skiing, cycling and hiking. “It’s a real live exchange that is very, very positive not only from the point of being on paper but real people exchanging places, exchanging ideas, learning from each other and growing as we do it,” Kurz said. Kurz adds that only in America can someone from another country rise to such high political office and serve his or her adopted community. “The fact that I was mayor here, the fact that I was on the town council for many years — that wouldn’t happen in Austria,” Kurz said. Five days of skiing at each of the five ski areas of the Arlberg region – Lech, Zürs, St. Anton, St. Christoph and Stuben – were added to the Vail Resorts’ Epic Pass in May.